We've teamed up with one of our favorite brands, Artisaire, to create a soft and modern color collection, just in time for wedding season! Our Tono x Artisaire collection features three new colors: Sand, Dusk, and Dove. 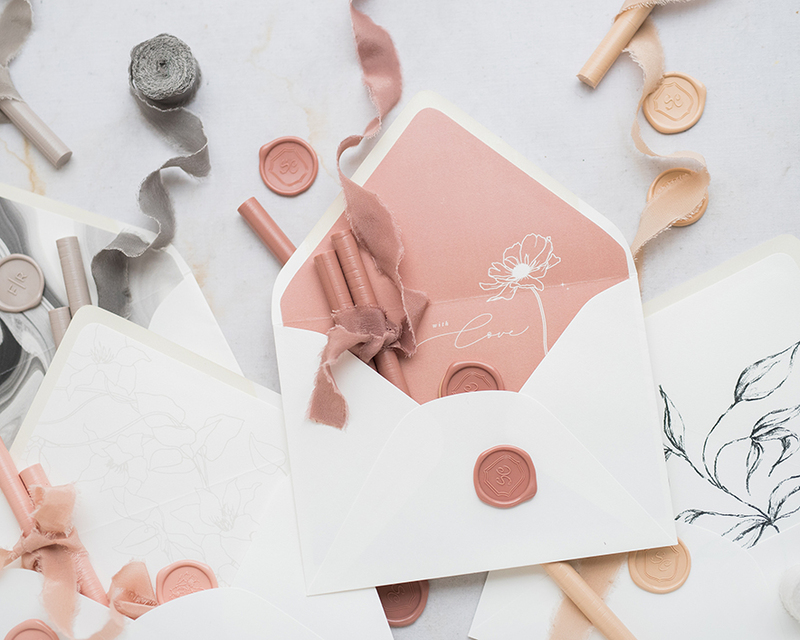 All three colors are now available in Classic Ribbon and Wax Seals with accompanying Envelope Liners. View the full color collection in our shop. A passion for color is something that we share with Artisaire, so we immediately found creative common ground. Artisaire partners with designers, like Jenny Sanders, to create curated pieces for all of your styling and stationary needs. They make all of their wax seals in-house and even have a full color lab where all of the creative magic happens! So where does it all begin? Artisaire worked closely with designer, Jenny Sanders, to develop an initial color palette. 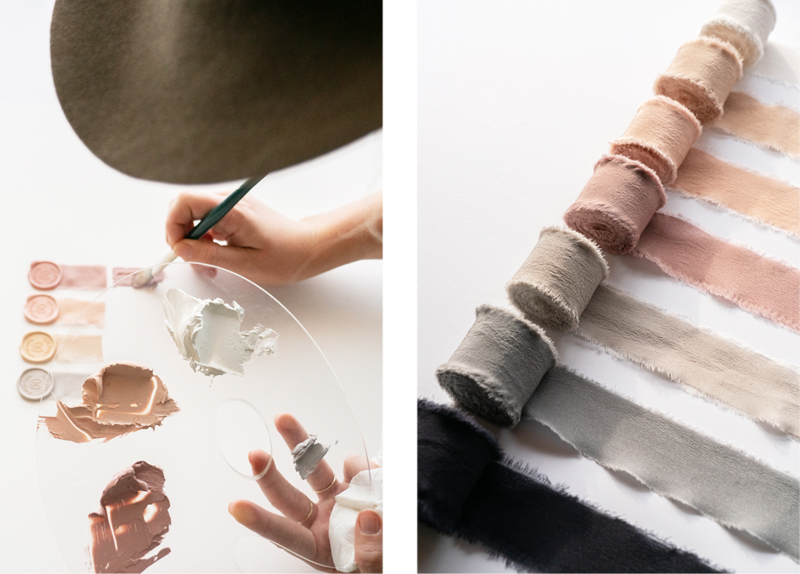 Paint swatches from their collaboration were given to us and we began dreaming of ways to replicate the colors in silk. Artisaire started color development of their wax seals and sent us several samples, giving us a feel for what the colors would look like in product form. We like to sit down as a team and discuss how to create the recipes for new hues. Color is an incredibly subjective topic, so it takes more than one pair of eyes to make a recipe! 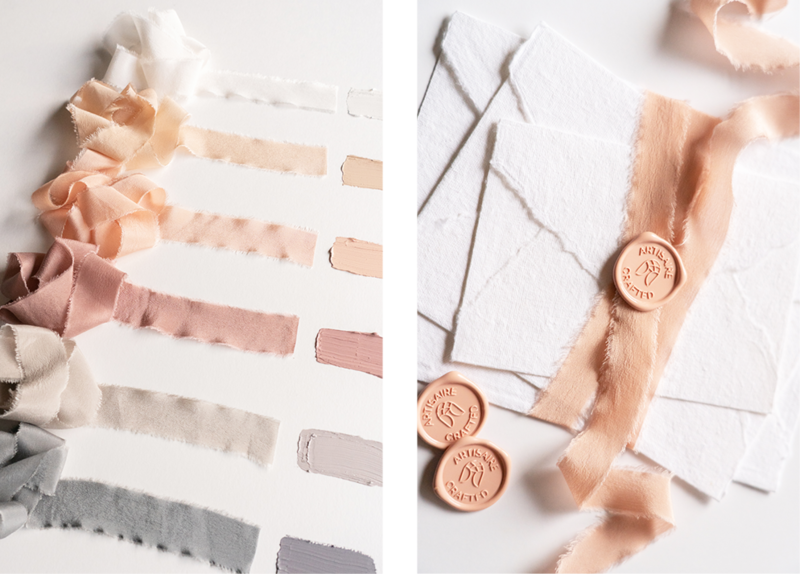 Between the paint swatches and wax seal samples, we settled on a tone that we thought would best suit the silk medium and accompany the wax seals perfectly. We then set out on experimenting and refining our dye recipes. Once our dye recipes are locked, ribbon production begins! Our ribbons go through several stages of creation. Starting with the dyeing of our "crepe de chine" silk, and ending with each ribbon being individually hand-torn and frayed to perfection. We are so happy to have Artisaire as our partner in development and love the look of the coordinating wax seals with our ribbon! 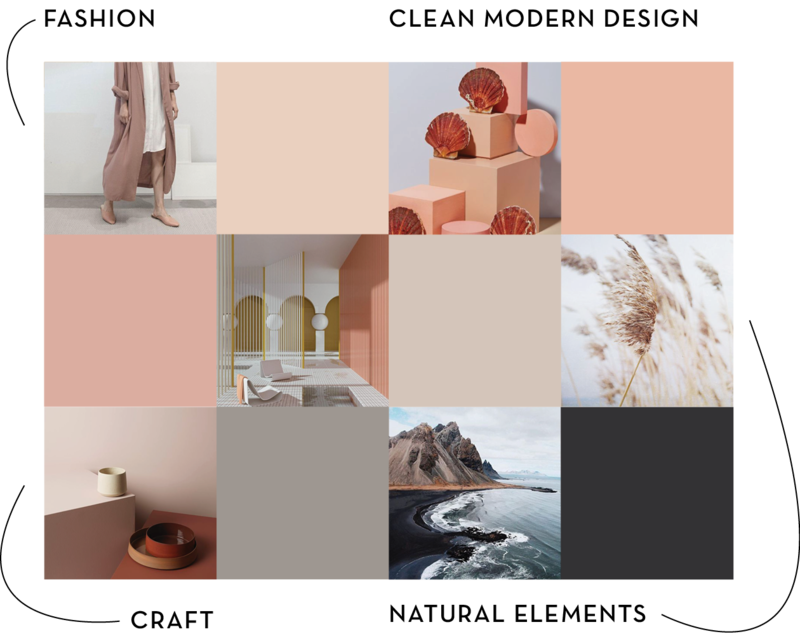 Color development is no small feat and so we are thrilled to finally share our collaboration with you! Check out Artisaire's Finishing Shop to find all of the collaboration goodies. For all Classic Ribbon colors and sizes, view our collection on the Tono x Artisaire Collection page.